The key when planting spinach is timing. 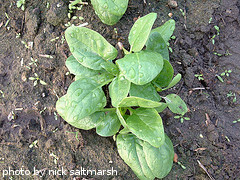 For spring planting, the idea is to get spinach seeds sowed a few weeks before the last expected frost, but after the soil has warmed up a little bit from winter. Spinach seeds need soil temps to be at least 40 degrees F for germination. If the weather cooperates and you time the planting just right, you can maximize your yield. Spinach that is grown in the spring will keep producing until the weather gets too hot (generally above 80 degrees F consistently) or until the days get too long (more than 14 hours of sunlight per day). If you live in a cooler climate, spinach is generally best grown in the spring. 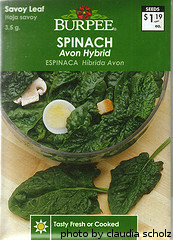 If you live in a more mild climate, spinach is often best grown in the fall. This is because the days are shorter and you generally don't have to worry about the weather getting too hot. The idea here is to get the spinach planted 8 weeks before the first expected frost. This will give the plants time to grow before the cold weather kills them off. In addition, you also want the soil temps to be 75 degrees F or lower when planting (the seeds have a hard time germinating in warmer temps). In the fall, the days are getting shorter anyway, so the lower number of daylight hours will work to your advantage. The first step in planting spinach is breaking up the soil with a tiller or by hand. You want to make the dirt as fine as possible to a depth of at least 6 inches. In areas with denser soil, consider growing spinach in raised beds or rows. After the soil is ready, use a hoe to create a furrow approximately 1/2 inch deep. Scatter the seeds, spacing them 2-3 inches apart. Cover them up with 1/2 inch of fine soil and tamp it down lightly. If you are planting multiple rows, space the rows 18 inches apart, just to give yourself enough room to harvest. After planting spinach seeds, water them in well. When the seedlings sprout in 10 days so, thin them to stand 4-6 inches apart, keeping the healthiest ones. If you want baby spinach leaves, the plants can be spaced closer together, because they won't reach full size. If you're looking for full-sized leaves, allow for more space between plants, because you want them to have room to reach maximum size. Depending on the weather patterns in your area, it may be advantageous to start by planting spinach seeds indoors in the spring. If you time it right, you can maximize the time the plants are producing outdoors during optimal growing conditions. 5 weeks before the last expected frost, start with flats or small cups, filling them most of the way up with good quality potting soil or top soil, leaving 1/2 inch at the top. Add 1-2 seeds to each section and cover them with soil, filling the sections or cups up to the top. Water the seeds in well and place them in a spot that gets as much sun as possible. A south facing window will usually do the trick. Keep the soil moist by watering the seeds every other day. When the seedlings have 4-5 leaves, they are ready to be transplanted. Before transplanting, harden off the seedlings to get them used to the cool weather outside. Start by putting them outside for a few hours a day for 2 days. over the next 8 days, gradually increase the time the seedlings spend outside during the day. By the 10th day, you can leave the seedlings out overnight. Then you can transplant them into the garden. To transplant the spinach seedlings, dig holes 6 inches apart and make them as deep as the seedling cups. 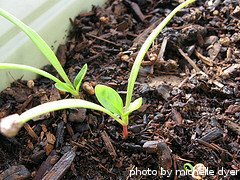 Carefully remove the seedlings from the cups or flats and place them into the holes so that the top of the root ball is even if the top of the garden soil. Backfill with dirt and tamp down lightly around each plant. After transplanting, water the seedlings in well. If you want to grow spinach in a container, make sure it is at least 6 inches deep and has good drainage holes in the bottom. For a larger circular pot, you can plant the seeds around the outside in a circular pattern, spacing them at least 2 inches from the edge. 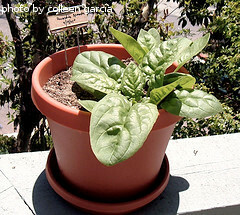 Spinach is also well suited to rectangular planters and containers. Just plant it and grow it like you would if it was in the ground. Make sure that the container is in a spot that gets at least 6 hours of direct sunlight per day.